Samuel Leigh (1780 – 1831) was a bookseller based in the Strand during the early decades of the the 19th Century. He specialised in travel guides. In 1829 he published an extraordinary book: Panorama of the Thames from London to Richmond. It mainly comprised a 60 foot long sheet which folded out concertina style, although some editions were made up of a series of individual sheets. On this ribbon of paper was printed a hand coloured aquatint of both banks of the Thames, facing one another, so one bank is always upside-down, depending on which way you hold the book. Approximately 15 miles per bank, 30 miles in all. This was, of course, immediately before the railways and almost half a century prior to Bazalgette’s embankments. Bridges across the river were still relatively few. It is therefore a marvelous visual record of the Thames of the late Georgian era. Fast forward to the early 21st Century and we find a man called John Inglis doing a very similar recording project, except, of course, using photography. His idea was virtually the same as Leigh’s, except – remarkably – at first he was blissfully unaware of the earlier work. Once Leigh was brought to his attention, it fundamentally transformed his own project in a most exciting way. Using rapidly improving web technology, the old and the new could exactly mirror each other in a tool that could prove both invaluable and entertaining to everybody from curious Londoners to serious historical researchers. This of course involved a massive increase in the workload and extension of the project timeline. With meagre funds, the project has relied on a dedicated band of volunteers. One of the challenges was to obtain a best possible digitised version of Leigh. Using six surviving copies, the team took high resolution shots of the best bits of each, and then digitally repaired them for colour correction, staining, cracks, folds and so on. This done, the team has now reached a key stage of the project: the book. Panorama of the Thames: A Riverside View of Georgian London by John Inglis and Jill Sanders is now published by Thames and Hudson. Apart from some nonedescript countryside parts of the riverbank, this book contains all of Leigh, both banks. The authors have departed from Leigh by treating each bank separately. This is something of a sacrifice it can be argued, but I think the correct decision. It has freed up space for text entries describing all notable buildings and structures, many of which no longer exist. The panorama has been divided into sections, with short introductions. The overall result is image rich with text relatively light and for me, that balance is perfect. The tome is large, quite weighty and simply wonderfully produced. Lavish. There is great pleasure between its covers. This is more than a book: it is a treasure. Treat yourself. Panorama of the Thames: A Riverside View of Georgian London (256pp) by John Inglis and Jill Sanders is published by Thames and Hudson with a cover price of £30. It’s available on Amazon and Waterstones. This publication is the first book from the project. More are planned. The ongoing Panorama of the Thames project is here. Check it out; have a play. There are more than a thousand works by the Georgian satirical cartoonist Thomas Rowlandson (1758 – 1827) in the Royal Collection. The Prince of Wales (later George IV) bought most of these, not as a connoisseur (which he was), but rather in a vain attempt to reduce the circulation – among the aristocracy at any rate, for he always bought the best examples. Queen Victoria, by contrast, adored them. We’d like to think that her reputation as a dour moralist has by now been well and truly scotched. Rowlandson, like his exact contemporary James Gillray, was a Londoner. As an artist he was formally trained. He was a bon viveur, a prankster. Any money he had, he spent. He sometimes lived in damp and dismal accommodation. But free spirit that he was, he knew he could draw his way out of trouble when he needed to, and he did. His work wasn’t as angry as Gillray’s nor as moralising as Hogarth’s before him. One senses it was a bit cleverer than theirs; that ideas came to him more easily and simply flew off his pen as they did. A new show at the Queen’s Gallery features around a hundred examples of Rowlandson’s works from the collection. They clearly demonstrate the scope and facility of his mind and pen. His talent as a caricaturist is demonstrated in this Hogarthian set of “types”. A whale which had been beached at Gravesend was making the news, detracting from the Duke of York’s failings. Here he beseeches the creature to stick around. The nation was fascinated by the French Revolution toward the end of a century of frequent conflict with France. Here are two examples of the same cartoon – The Contrast – demonstrating how English Liberty was far superior to its French equivalent, very much grist to the mill. Overtly propagandistic, the uncoloured version was priced at only 3d, encouraging the widest possible distribution. Very much a you-never-had-it-so-good sentiment. This work also appeared recently at the Magna Carta exhibition at the British Library. After Trafalgar, there was a possibility that Nelson’s body would be transferred to another ship to be transported home, but the sailors of the Victory were having none of it. No real axe to grind, this patriotic and sentimental print makes the point. Nelson’s body was conveyed in a barrel of brandy of course, but hey. It would another half century before cartoons like this appeared in newspapers and magazines. They were distributed individually from print shops at prices ranging typically from one to eight shillings. Collectors tended to mount them in volumes to be handed around on social occasions. Buyers and those who couldn’t afford to collect would eagerly browse the latest examples in print shop windows. The back wall of the exhibition has a selection displayed in this way to give you a sense of the print shop window. I works rather well. And here is a rare and interesting survival: a screen decorated with cut-outs from the leading satirical prints. The wealthy could afford both to collect prints and to cut them up. These examples can but give you a tiny taste of the show, for this is a substantial and important exhibition, a must for anyone interested in the late-Georgian satire boom, the likes of which were not seen again until the early 1960s. Note. Included in your ticket is another quite exquisite exhibition running in the gallery over the same period: Masters of the Everyday: Dutch Artists in the Age of Vermeer. All images courtesy Royal Collection Trust. Photos: Mike Paterson. 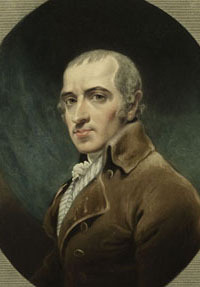 This year is the 200th anniversary of the death of the London cartoonist James Gillray (1756 – 1815). He’s one of our best-known illustrators, usually mentioned in the same breath as Hogarth, Tenniel and Shepard. Like Hogarth earlier in the century, Gillray trained as an engraver and followed that trade for a short while before discovering his métier. That profession was the vicious lampooning of prominent persons, primarily politicians and royalty. So rich were his ideas conceptually that they have provided templates for cartoonists ever since, but primarily during our own times. He’s imitated more so even than Hogarth because his illustrations are more punchy, more precise, less cluttered. This frequent habit of cartoonistic homage down the years forms the basis of a new exhibition celebrating the Gillray anniversary: Gillray’s Ghost, at the Cartoon Museum. It features about 70 items: original hand-coloured prints by Gillray, alongside the modern equivalents by the likes of Steve Bell, Peter Brookes, Chris Duggan, Martin Rowson, Dave Brown, Nick Garland and others. 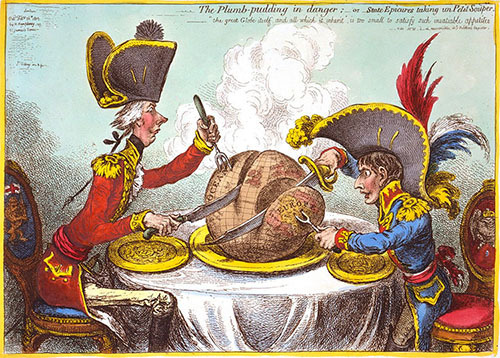 The most fecund of these, and the headline illustration of the show, is The Plumb Pudding in Danger from 1805 (pre Trafalgar), featuring Pitt and Bonaparte carving up the globe. Food and gluttony are, of course, a common trope for cartoonists down the years. There are at least half a dozen variants of this in the show. 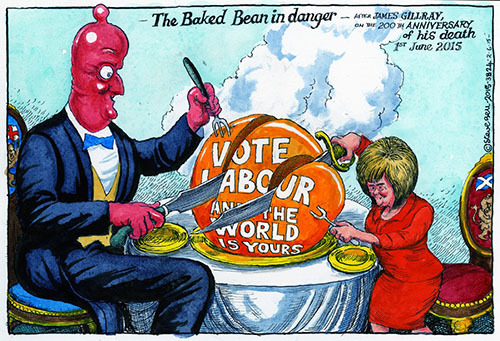 Here, using David Cameron and Nicola Sturgeon, is Steve Bell’s. The Baked Bean in Danger. Anniversary homage by Steve Bell. © Steve Bell. 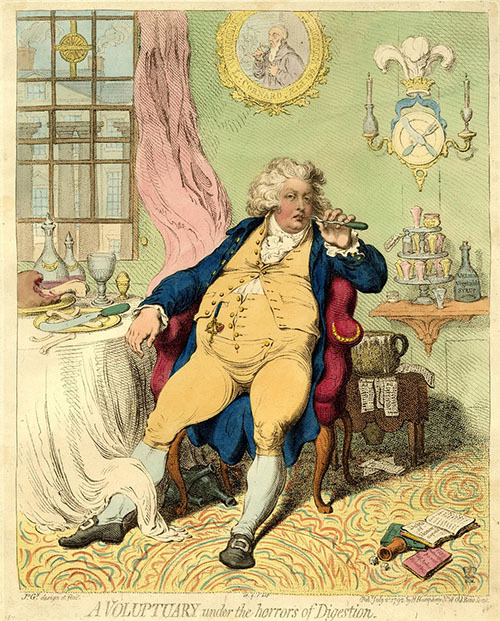 To my mind, the most famous of all is A Voluptuary, the image of the Prince Regent, leaning back languidly, picking his teeth with a fork, not a care in the world. 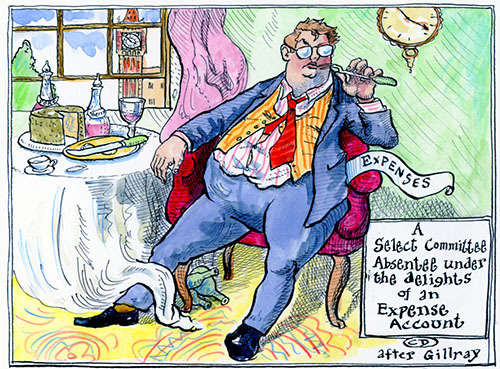 Chris Duggan’s cartoon shows a select committee absentee, ditto. Here we have Pitt, Fox and Adlington wrestling each other while Bonaparte is about to assassinate Britannia from behind a curtain. Britannia Between Death and the Doctor’s (sic). 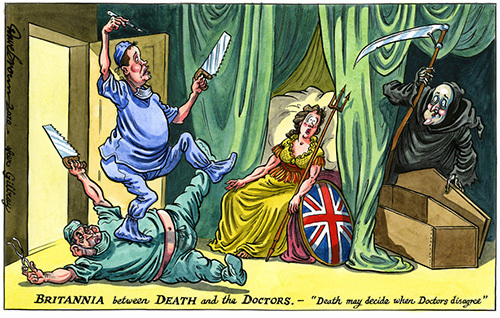 Dave Brown’s version shows Brown and Clegg as the doctors with Cameron as Death. And so on. The exhibition is well conceived and nicely executed. As ever with the Cartoon Museum, thoughtful and thought-provoking. 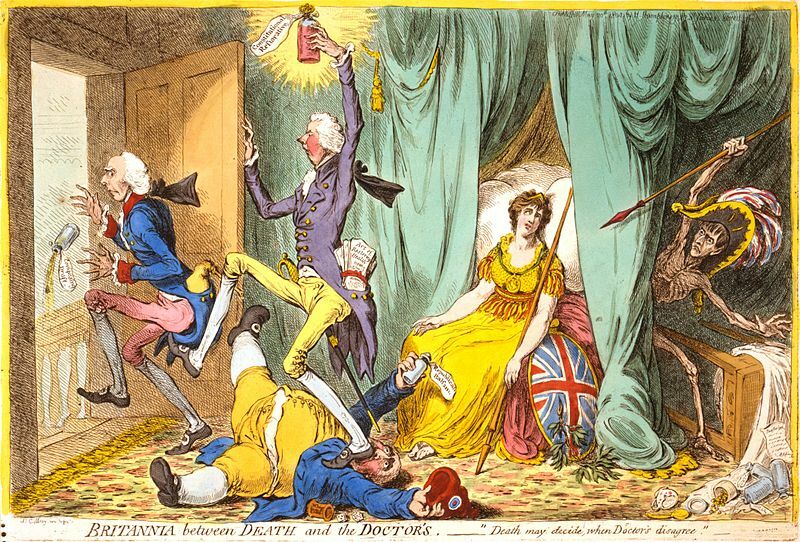 Gillray’s Ghost runs at the Cartoon Museum until 17 January 2016. The exhibition is included in museum entry of £7 adults. Friends of the Museum and Art Fund members enjoy free entry. Monday 16 November, 17:30. Introductory talk by Cartoon Museum director, Anita O’Brien. Glass of wine included. All tickets £12.50 + fee. Book here.